I’ve managed with the passing of time to restrain my desire to buy books based exclusively on their covers. Not always the pleasure of adding a book with a particular cover in my collection extended into the satisfaction of reading what was in between its covers. One of the artists who revives my almost uncontrollable desire to buy books only by seeing the covers he makes for them is Joey Hi-Fi. The covers made by Joey Hi-Fi for Lauren Beukes’ “Moxyland” and “Zoo City”, Chuck Wendig’s “Blackbirds”, “Mockingbird” and “The Cormorant”, Tony Ballantyne’s “Dream London” and for the UK and South African editions of Charlie Human’s “Apocalypse Now Now” are stunning. His great talent and style send me into a tailspin with each cover, so much that I tend to submit to a buying spree without any other consideration for the book in question. I experienced another such moment this morning when I could admire at Lauren Smith’s excellent blog, Violin in a Void, the new cover artwork signed Joey Hi-Fi. This time is for a novel by Louis Greenberg, “Dark Windows”. The novel is the first personal project of Louis Greenberg after the writing collaboration with Sarah Lotz that produced, under the pseudonym S.L. Grey, several short stories, three novels, “The Mall”, “The Ward” and “The New Girl”, and two other future ones due to be released by PanMacmillan. “Dark Windows” will be published in South Africa by Umuzi on April 2014 and although my first impulse was to get a copy of the novel as soon as it is released I’ve succeeded in overcoming the desire and got a look at the synopsis too. 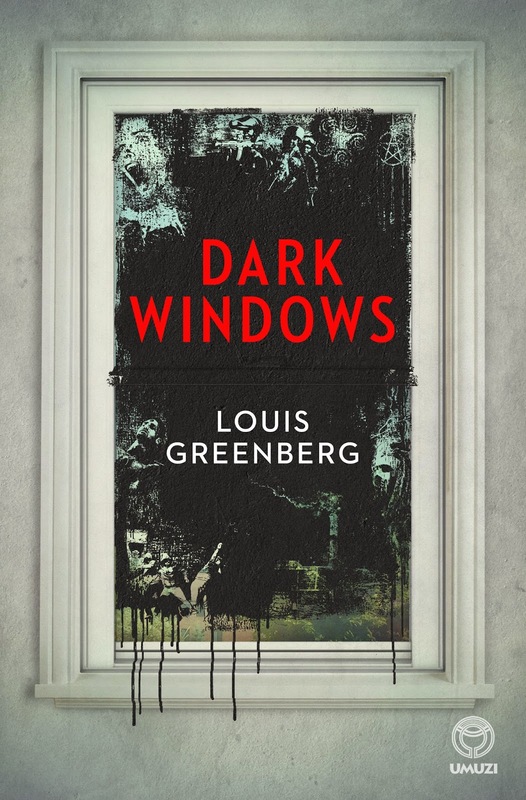 And though Joey Hi-Fi’s artwork remains the main attraction, the synopsis is interesting enough to make a purchase without many regrets when the time comes for Louis Greenberg’s “Dark Windows” to be published. If you head to Lauren Smith’s Violin in a Void, where the book cover was revealed, you can also read an interview with Joey Hi-Fi. Dark Windows is set in an alternative-present Johannesburg. A wave of New-Age belief has radically altered the country’s political landscape, but not everyone buys into the miracle. Gaia Peace, the party which swept to power ten years ago on the back of a miracle cure for crime and a revolutionary social welfare programme, is still firmly ensconced, but the cracks are showing. Jay Rowan does his job and doesn’t ask questions. He’s already in probationary therapy for a drunk driving accident, and he’s not looking for trouble. Now Kenneth Lang, a veteran political aide, has hired Jay to paint in the windows of apparently random vacant rooms. Lang has survived a long career of political change, and is not about to start questioning orders, even when they are as misguided as senior minister Meg Hewitt’s latest obsession, project Dark Windows. A mystical charlatan has convinced her that she can attract a world-changing supernatural visitation, the Arrival. Beth Talbot, the married woman Jay is seeing, is compelled by the supposed suicides of two students in a residence building. Her growing interest in the case leads her to a seditious student group and back into the past she’s been trying to avoid.